The pieces of the new World Trade Center are finally falling into place. In March, the main concourse of the Santiago Calatrava-designed World Trade Center Transportation Hub, also known as the Oculus, opened. In June, Liberty Park opened and 3 World Trade Center topped out. Last week, the Westfield-operated mall at the Oculus, complete with an Apple Store, opened to the public. And now, it appears demolition is about to begin on the temporary PATH station, paving the way for the new Performing Arts Center to begin construction. Last week, alert YIMBY Forums user Thomas_Koloski posted the below photo of the site. In it, a small crane is visible at center-left, and a range of other construction equipment also appears to be readying for demolition. The site is situated east of One World Trade Center, south of 7 World Trade Center, and west of the site of 2 World Trade Center. The old station closed on June 26th, since commuters can now use Calatrava’s Hub. In late June, it was announced that Ronald O. Perelman had donated $75 million to the center, formerly dubbed PAC WTC, and it will now officially be called the Ronald O. Perelman Performing Arts Center at the World Trade Center. The center will feature three theaters, with capacities of 499, 299, and 100 people. They will be reconfigurable into one 1,200-seat venue. 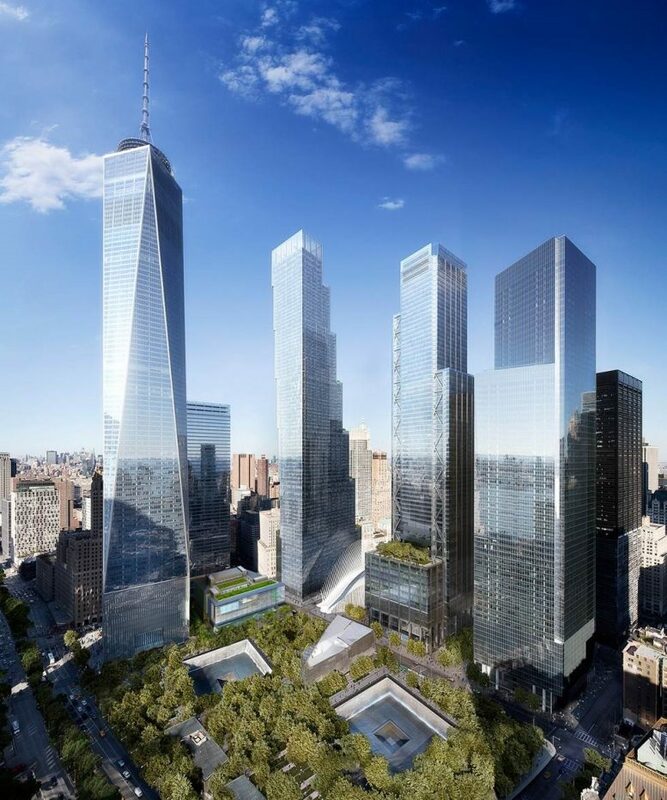 There will also be a café, which officials hope will attract not only those attending events at the center, but pedestrians traversing the World Trade Center campus. Groundbreaking for the center is currently targeted for early 2018. The Brooklyn-based architecture firm REX will be designing it. 6 Comments on "Demolition Imminent for Temporary World Trade Center PATH Station"
My favorite project keep onward everyday, one of the most powerful towers that terrorist can’t destroy. Is that an official rendering of the PAC? The final design has not yet been confirmed. This is the second temporary PATH station on the site. 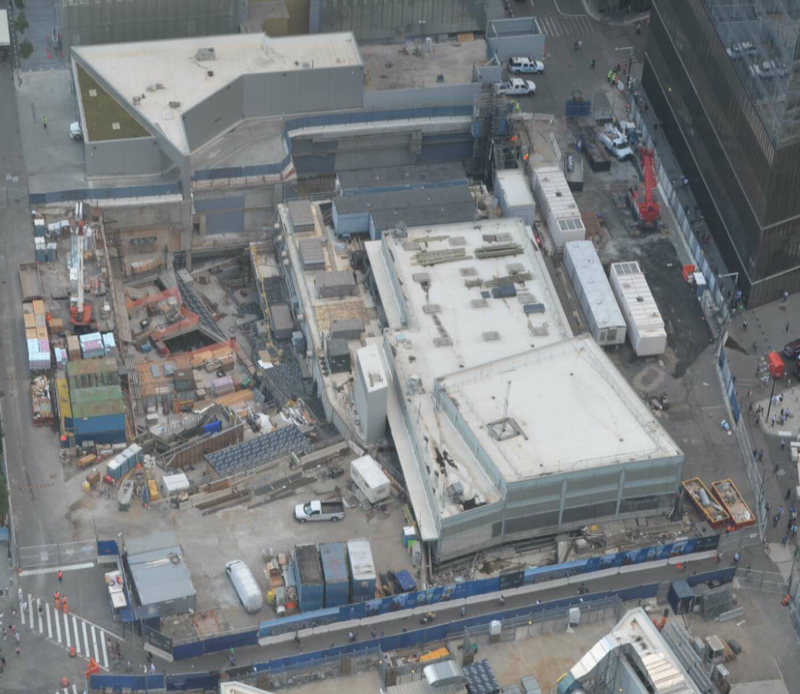 The first was at facing Church at Vesey and stood until 2009. Any news about WTC 2? I hope they choose the diamond design. Are they going to use Jet Fuel to demo it? That worked out really well for the Towers and Building 7 (which wasn’t even hit by a plane).